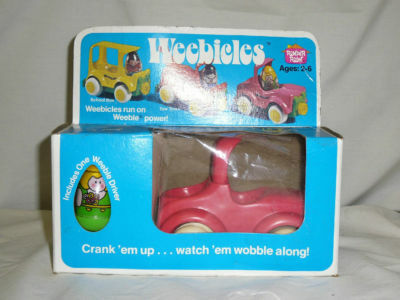 Description: Little Cars That Run On Weeble Power! 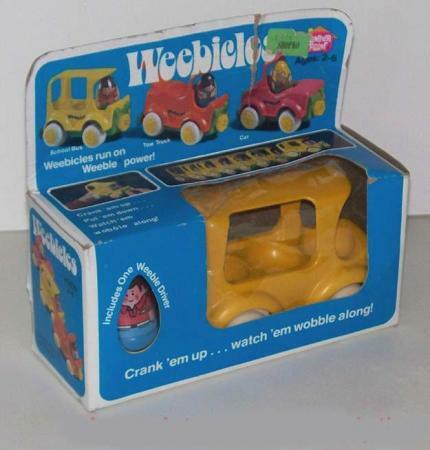 Crank 'em up, watch them go, and the Weeble driver figure wobbles in the seat during the ride. There's a Weebicle tow truck complete with tow hook, a sunny yellow school bus, and a Weebicle car - and Weebicles can never be overwound! Car - HTW344 - Small 2-seat pink car with a tall "windshield" (with open window hole in the center) between the front and back seat. The car has a green base, green back bumper, and a green front grill with a yellow "screw" (turn-knob) in the center. The hood and both side doors are marked "Weebicles" in black. Rolls on 4 white wheels with yellow "hub caps". Center of each "hub cap" has a "W" imprint. 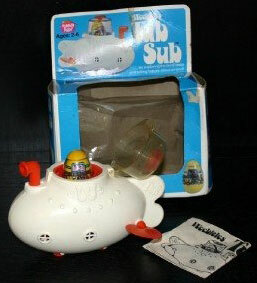 Weeble - HTW6n - Green base, yellow top (hair), green shirt, holding flowers. Marked "©1973 Hasbro". Measures 2" tall. Bus - HTW345 - Small 3-seat yellow bus with a tall "roof" on top (roof may be removable?). The bus has a green base, green back bumper, and a green front grill with a yellow "screw" (turn-knob) in the center. The side of both doors are marked "Weebicles" in black. Rolls on 4 white wheels with yellow "hub caps". Center of each "hub cap" has a "W" imprint. Weeble - HTW5n - Blue base, brown top (hair), red shirt with cuffs and collar. Marked "©1973 Hasbro". Measures 2" tall. Tow Truck - HTW346 - Small 2-seat orange tow truck with a tow boom on the back and a small "windshield" (with open window hole in the center) between the front and back seat. The truck has a green base, green back bumper, and a green front grill with a yellow "screw" (turn-knob) in the center. Rolls on 4 white wheels with yellow "hub caps". Center of each "hub cap" has a "W" imprint. Weeble - HTW8n - Blue base, brown top (hair) boy with white shirt with red/white cuffs and collar, red belt, and red "W" on his chest. Marked "©1973 Hasbro". Measures 1-3/4" tall.